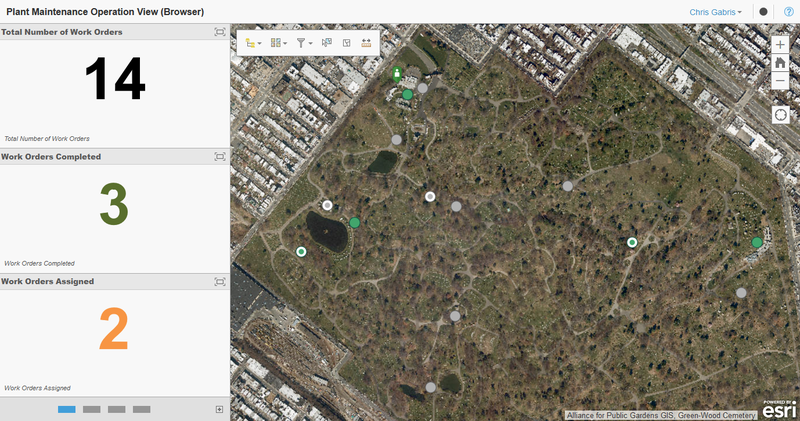 At Green-Wood Cemetery, staff are working to phase out paper forms for Field GIS applications. Using Collector and Workforce for ArcGIS, Green-Wood is streamlining work order assignment and management for plant collections and monument restoration. Located in Brooklyn, New York, Green-Wood is one of the first rural cemeteries in America. Founded in 1838, the site is a National Historic Landmark and an accredited arboretum that attracts over 500,000 visitors annually. Green-Wood is also massive, spanning 478 acres and containing over 560,000 “permanent residents” and well over 7,000 trees. It is essential to keep Green-Wood looking spectacular for visitors, but managing the volume of work orders over so much space can be challenging. With help from Alliance for Public Gardens GIS (APGG) and Blue Raster, Green-Wood is swapping paper forms for Field GIS mobile applications to create, assign and manage work orders. Using the latest Esri technology, including ArcGIS Enterprise 10.5.1 and Portal for ArcGIS, the team imported and configured plant center and monument locations into the Parks and Gardens Information Model and hosting it in the Cloud. Using Collector for ArcGIS, Green-Wood staff can now create work orders in the field on a mobile device. Blue Raster configured a python script using the Esri REST API to push data from Collector to Workforce for ArcGIS every 15 minutes. A dispatcher can then assign tasks to field crews, using the mobile version of Workforce for ArcGIS to manage their assignments. Finally, Blue Raster configured a real-time operations view for both plant maintenance and monument restoration using Esri’s Operations Dashboard. These dashboards will allow for management to quickly see key metrics, including the total number work orders, and work orders by team or type.